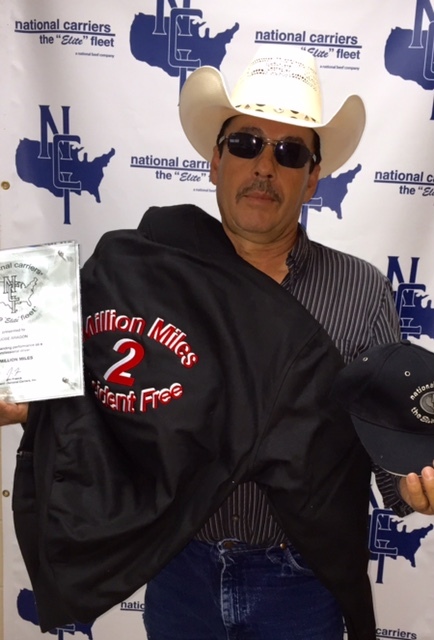 Professional livestock driver Jose Aragon has been recognized for safely driving two million miles on behalf of National Carriers Inc. Aragon has not had an incident or accident in the past two million miles while working for the “Elite” Fleet. He has been an owner operator for NCI since September of 1997 lives in Satanta KS and is viewed as a safety leader among “Elite” Fleet drivers. Aragon is an independent owner operator transporting livestock within a six state region. National Carrier Inc. presented Aragon with a wall plaque a matching hat and jacket to commemorate his achievement. National Carriers Director of Safety Jill Maschmeier states “Jose is a good solid business man who has worked at NCI for almost 20 years in our livestock division. Jose takes great pride in how he represents NCI and is impeccable in his appearance. I often wonder how a person can stay clean and do that job? He makes me proud to say he is part of the ‘Elite’ Fleet! National Carriers is a diversified motor carrier servicing all 48 states in the continental United States with transportation offerings which include refrigerated livestock and logistical services. At National Carriers our mission is to be the safest most customer-focused and successful motor carrier in our class. For more information visit www.drivenci.com. Being part of the Elite Fleet® means enjoying a career worthy of your skills and commitment to excellence. We believe long-term success is waiting for you at National Carriers® one of the nation’s oldest most respected and largest carriers. Learn about our exciting opportunities for owner operators as well as company drivers. If you are interested in a leasing a truck National Carriers® Leasing Division is the ideal partner to help you get started.